The Boycott, Divestments and Sanctions (BDS) against Israel needs to be countered and soon. Yes, there are some states in America and even thoughts of a Federal Law against the BDS type of brandishing, specifically when it chooses only a single target, in this case Israel. Much of the BDS movement is pure and simple anti-Semitism and many of its supporters are willing to believe the evils claimed to be committed by Israel without doing any in-depth research to find the truth. But the sheepish followers have no reason to not believe the lies told as they are bombarded by multi-billion dollar propaganda financed with oil money from the Arab Middle East and regurgitated by their leftist professors who simply hate Israel. For some reason, perhaps a form of latent anti-Semitism which lies deep within the societal conscience after three millennia of persecuting the Jews, it becomes easy to believe that the State of the Jewish People is doing all those horrid things as, after all, our societal subconscious remembers the stories which were told throughout history in Europe, the Middle East, North Africa, Russia and beyond of how the Jews poisoned the wells causing the plagues, Jews used the blood of innocent Christian (Muslim) children to bake Matzoh (Passover bread), sacrificing non-Jews on their secret religious ceremonies in their houses of worship, this was often used to explain the disappearance of individuals, specifically those who were killed by the rulers in secret and often left the body in the Jewish house of worship as proof; cannibalism, money theft often linked to usury, drinking blood of non-Jews as a medical remedy, casting evil spells, hexing, black magic, spying as enemy agents, disloyalty, stealing organs for transplant into Jews, stealing particularly children’s eyes preferably blue eyes, murders, arson and almost anything else one could try and blame the Jews and these falsehoods were readily believed and often led to pogroms or the sacking of the Jews ghetto forcing the Jews to flee often with most of their possessions destroyed or stolen. These were called blood libels simply because the earliest ones all revolved around the Jews using non-Jewish blood in rituals, holy observances, sacrifices or in the production of Jew food such as Matzoh. These are the historic demonization of the Jews, which were common throughout the Christian and Muslim worlds, though this was more prevalent in the Christian world; Islam was not innocent of such accusations against the Jews. The modern blood libels are more subtle and devious centering on the Jews as being a group which stands separate from others and acting exclusively against any non-Jews, goyim. Just for clarification, in Hebrew, the word goy means nation or people and when used in the plural, goyim, it means non-Jew, as the Jews are a single nation thus the plural cannot be applied to the Jews. It has no connotation of good, bad or evil, it simply means people and slang it is used to denote other. But there have even been the rehashing if blood libels with Hamas recently invoking the tale that the Jews were killing Palestinian Arabs for their organs and even kidnapping Arab children for their beautiful eyes. The Arab world has oft repeated the Matzohs are made using Arab children’s blood which the Jews get by kidnapping an Arab youth, usually under the age of five or six, and placing them alive in a barrel with nails driven through it and rolling it to bleed the child. Hint, if you were at all familiar with Jewish Halachic Law, you would know that the Jews are forbidden from eating blood and that this is why they salt their meat so heavily, so as to remove every last drop of blood in a final rinsing. The canard that the IDF kills Arabs for their organs is so obviously false just on the face of it as organs must be matched to the recipient from the donor so closely that it would be impossible to use any randomly procured organs. 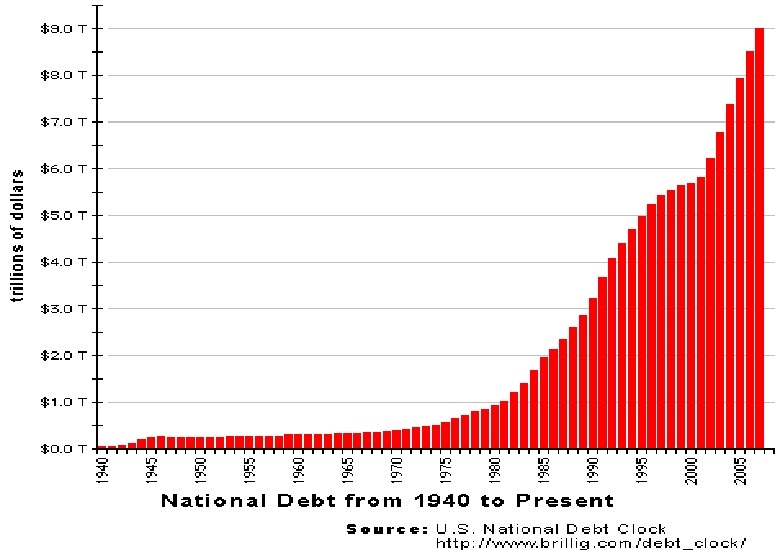 The blood libels today are also more inventive and varied in order to match the modern times. There is one that Israel does not allow the Arab Palestinians to vote. Well, the first question which need be asked would be, vote where and in what elections. The answer will usually be that Israel will not allow the Palestinians to hold elections. The truth is a bit different. First, it is true that the Palestinians are not permitted to vote in Israeli elections. Along that line, neither are Jordanians, Egyptians, Syrians or any other peoples outside of Israelis permitted to vote in Israeli elections. The Palestinians reside in two regions with each having their own governance. In Gaza, Hamas rules, chooses their leaders and it is your basic dictatorship and thus no elections. In the West Bank (for the remainder of this article we will use the name Shomron which is an area of Judea and Samaria which Jordan occupied illegally from 1948 through June 1967) are ruled by the Palestinian Authority. The President, Mahmoud Abbas, knows that should he permit elections he would not win and thus loose the protection of his Force 17 and very likely end up killed by those he has, we’ll just say upset. This has led to him now serving the twelfth year of his four or five year term which began in 2005. He cancelled the 2009 elections, failed to initiate the next attempt, cancelled a couple of others and lastly an agreement with Hamas to hold election in both Gaza and the Shomron ran into some difficulties, is how it was explained. So, Israel has nothing to do with whether or not the Arab Palestinians get to vote or hold elections, that is up to Hamas and the Palestinian Authority, neither of which are all that fond of the people voting. On a different note, the nearly 20% of the Israeli population which are Arab get to vote along with Christians and numerous other groups including some you may never of heard of such as the Baha’I and they all get to vote along with the Jews in Israeli elections. The criteria are very simple, if you are an Israeli, then you vote in the Israeli elections and if you are not an Israeli, you don’t. Another complaint is that the Arab Palestinians must pass through checkpoints to go into Israel. So, Mexicans, Canadians (largely) and any foreigner entering the United States also get to go through a checkpoint to enter, it is called Customs. Further, Israelis get to go through checkpoints in order to go to the movies, shop in a mall, go to many restaurants, enter hotels, ride the trains and all sorts of things as part of preventing terrorism. You know, kind of like taking off your shoes, belt and all metal objects and possibly more, depending on the TSA Agent’s mood, all to prevent terrorism on aircraft. The main thing one need filter the claims against Israel through is that the Palestinian Arabs are not Israelis and are treated as the foreigners they are. Remember their claim that they want their country of Palestine established, not returned because there has never been a nation called Palestine, it was a reference to a region which included Jordan. So, the claims against Israel are largely false or a very long stretching of half-truths. This makes the BDS movement something resting atop of a foundation of lies. Israel is far from an Apartheid state as Israelis come in ever hue and racial variety. 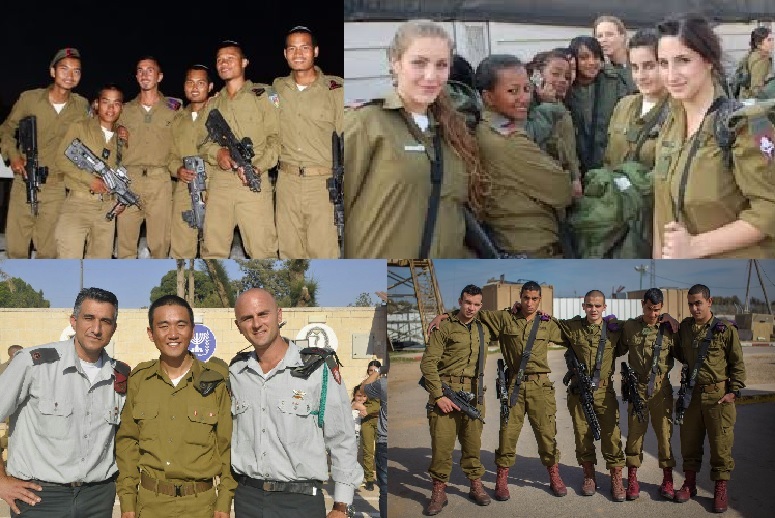 Below we have four pictures of soldiers from the IDF which includes a cross-section of races, national origins, genders and all the variety one might not expect. Israel is amongst the least race-conscious places on the planet. But the BDS movement is counting on your having absolutely little and preferably no knowledge about Israel. Then there is the other means that they often convert music stars, actors and actresses, politicians and other famous people by bringing them on a guided tour of Israel and Palestinian areas. The principle word is guided. First, they will take the victims, and that is what the group is, on a tour of northern Tel Aviv and Netanya, best portrayed as the Israeli version of Biscayne Bay, Florida or similar very expensive and elite neighborhoods to show the way the average Israeli lives, trust us, it is anything but average; then they take them on a tour of a few, as many as five, “typical Palestinian villages, never Nablus or Gaza City, these are Potemkin Villages in reverse, screen sets showing poverty and desperation with a cast of actors who put on the act claiming all sorts of horrors and a story of how they were thrown from their grand home somewhere in Israel, often Tel Aviv or Jerusalem. These villages do not have an actual permanent population, they are sets which lie empty except when they need to put on a show. When people talk about the abject poverty in these villages, ask them if they got to visit places without a guide and simply roam around unchaperoned, something which would actually be hazardous to many people if they were to visit certain areas, just like any city, there are just areas which are not as safe as one would like when roaming around. We would not even suggest roaming around our town though the chances of walking into trouble is virtually nil. The BDS stories are full of falsities and misleading statements which all rely on your believing that were the Jews to ever get their own nation, they would act with such animus as a reaction to the treatment they received at the hands of others. The reality is exactly the opposite if for no other reason than the Torah instructs us in Exodus, Chapter 23, Verse 9, to “And you shall not oppress a stranger, for you know the feelings of the stranger, since you were strangers in the land of Egypt.” Instructions do not come much clearer than this one. Jewish Oral Law tells this even further telling us to love the stranger amongst us. The Palestinian Arabs are not amongst us and where they do mix with us they are accepted and trusted which has led to tragedy on the rare occasion that one of the Arab Palestinians decides that shooting the people they work with might be a good way to win friends and influence people. This was exactly what happened in the Barkan Industrial Park shooting where Ashraf Walid Naalwa tied-up and shot to the head execution-style Kim Levengrond-Yehezkel age twenty-nine and Ziv Hajbi age thirty-five as well as injuring severely with shots to her torso a fifty-four-year-old woman employee who preferred to remain anonymous. We would like to note that the remaining Palestinian Arabs with passes allowing them to work in the Barkan Industrial Park remain employed and working in the park alongside the Israeli employees, many of whom are Jews. There were no retaliatory actions taken against the other Park employees including those in the specific manufacturing plant where this shooting occurred. The BDS people would probably only refer to the fact that in this case the IDF killed Naalwa when attempting to take him into custody leaving out the part that he had attempted to shoot his way out of being taken. Hopefully you are getting a sense of the extremes and lies which are behind and powering the BDS movement and their reliance on the proclivity for people to believe the worst in Jews and thus even more-so of Israel. 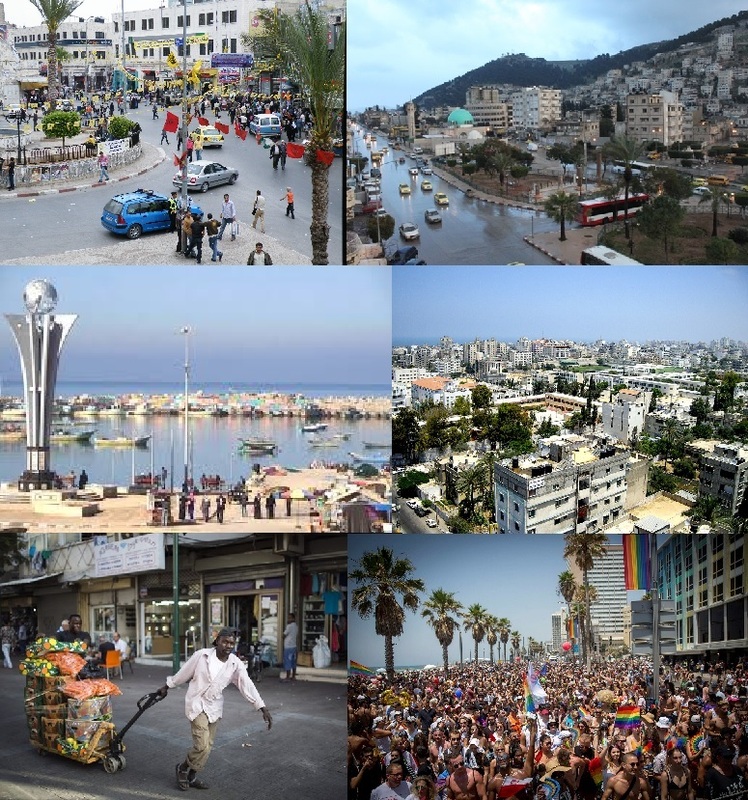 Below are six pictures, before looking at the description, try and figure which are from Israel and which from Nablus ruled by the Palestinian Authority and which are from Gaza City under Hamas rule. The reality is that there are almost indistinguishable neighborhoods in each with greatly varying levels of wealth. There are extremely wealthy Palestinian Arabs and there are Israelis living with meager wealth. According to the story-line given by the BDS propagandists, there are only uber-wealthy Jews and impoverished Arabs. That is as large a lie as any of their other claims. Israel is a vibrant, democratic, equal, varied and diverse country with its share of problems just like any other nation. 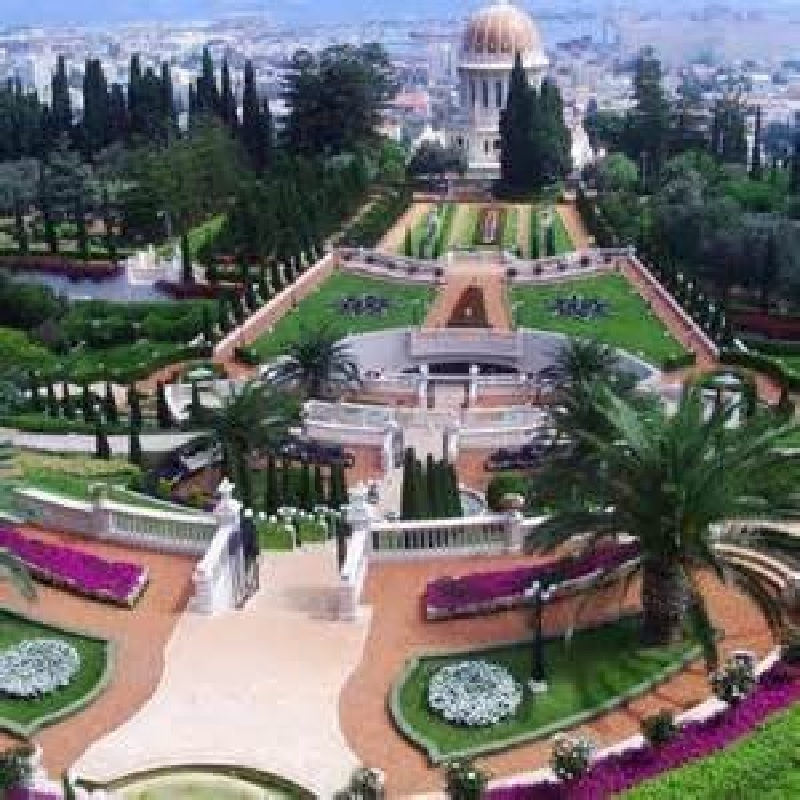 Is Israel perfect, absolutely not, but it is one of the most pleasant and accepting places and rates as the eleventh happiest nation which when one considers all the various challenges faced by Israel, that is a remarkable little fact. Does being the eleventh happiest country sound anything close to what the BDS propagandists paint as the picture of Israel, full of hate and almost a police state? The Israel we see everyday and in our travels is a place where we are glad we moved here and made it our new home. We can compare it well against our life in America and as there are things which are better in the United States, there are things about Israel which puts it ahead of America. Israel is a wonderful, open and free society where people from numerous and varied nations and cultures live largely in harmony. 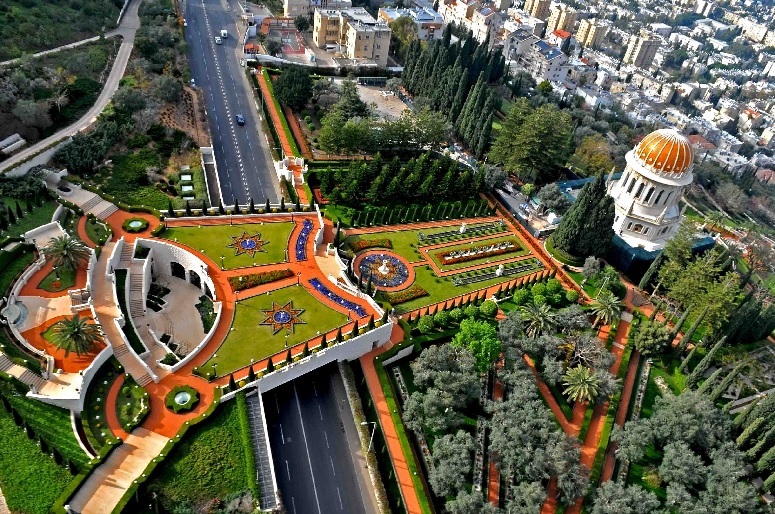 Israel is one of two centers, the other is India, for the Baha’I people and has one of their two beautiful centers with its perfectly manicured gardens. Unfortunately, most of the news about Israel is about terrorism, the Palestinian Arab difficulties which are largely because the Arabs have refused every offer to provide them with a state. What the BDS people do not tell you is their efforts are a continuation of the Arab boycott of Israel and that the only state the Arabs are willing to accept is one where they replace Israel and the Jews are made to find another nation to accept them. Should no nation be willing to take the Jews in, the Arab solution to that is to finish what Hitler started, and they admit this in Arabic amongst themselves, never in English as that would reveal a truth they prefer not to advertise. Before reading our final paragraphs, please take a long look at the map below. Are the Palestinians needful and suffering? That is a valid point. The question is where they should be settled. Should they replace Israel and leave the Jews to suffer whatever the world decides, which would likely be closed doors leading to very bad results. Where is there room for these refugees? Let us compare two people’s refugees. The Arab refugees from the formation of Israel were placed in refugee camps and locked there to be used as a weapon against Israel. Their original numbers were somewhere around seven to eight hundred thousand and over the decade after the formation of Israel the Arab world made over eight-hundred-thousand Jews, most of which came to Israel and were absorbed into the country and given full rights. Why cannot the Arabs take their own brothers while Israel absorbed an equal number of refugees. Because they have been ostracized by their own people, their numbers grew to where they are reputed to be more than five million which makes their return to Israel unthinkable. When many of them would have little other than killing the Jews should they be given the opportunity, this would make their inclusion in Israel difficult, but the Arabs want their nation to replace the Jews and take everything the Jews have from their wealth to their lives. There have been refugee swaps after most wars, there was the exchange between India and Pakistan and no one was placed in a camp, there was a refugee problem when Poland annexed lands previously belonging to Germany and there were no refugee camps, only the Arabs decided that their brothers were to be separate and never treated as equal. The Arabs who remained in Israel are treated as equals in Israel and have identical rights as every other Israeli citizen. How is it Israel could accept the Arabs, many homeless after the 1948 Arab war on Israel, but the Arab nations are unable to do similarly? The reason is that they are hypocritically using their brothers and sisters as a weapon to power the BDS movement which is designed to destroy Israel as the Jewish state and send almost seven million Jews out of their homes making them stateless. Lastly, how can there be a Palestinian Arab refugee camp in Gaza City or Nablus or the others within the Palestinian ruled lands under either the Palestinian Authority or Hamas? Here is a link to a one-hour informative examination of the Arab Palestinian Refugee problem. What is needed is an anti-BDS movement to counter their poison and defamation of Israel. It should be a simple movement where people actually need only perform two small tasks. The first is to sign a petition supporting Israel and her right to exist as the Jewish State as long as she continues to recognize and respect the minorities living amongst her. The second is to make an effort to buy Israeli products when choosing products. Israel makes some of the worlds finest wines, grows and exports produce and manufactures an impressive array of products. Many of us already own some items which are very dependent on Israeli technology and developments. Even the BDS anti-Semites use such products and if they were to be honest, they would avoid all things Israel and not just what is easy. Such things include your cell phone which relies on Israel technology, all Intel microprocessors, instant messaging software and so much more. There need be an NGO to counter the BDS movement which respectfully informs people who decide to cancel appearances in Israel or otherwise fall victim to the harassment policies and practices of the BDS movement who bombard their web sites and e-mails with threats and demands that they treat Israel as the pariah amongst the nations and berate these people until they cave. The anti-BDS would simply bolster their decision not to fold to the threats and inform them that they are being victimized by people using multiple e-mail accounts and identities and they are only a minority. There would need to be a web site which included a list of people willing to support Israel and another of companies which support Israel including all those with research and development sites located in Israel or manufacturing in Israel. It would also provide a list of Israeli products which people could choose and prefer in support of Israel. And it should offer bumper stickers which state different pro-Israel statements such as, “I Buy Israeli,” “We love Israel,” “Israeli Products Inside” and other supportive slogans often including a Star of David replacing the letter “o” for added effect. The “Israeli Products Inside” could also come in a smaller size sticker which companies could place on their products which have Israeli made or designed products inside showing their support for Israel and all she has given the world. Such a movement would gain strength as more people displayed pro-Israel sentiments making it less stressful and threatening to support Israel because now you have support and are not alone, that is the secret. Perhaps the best sticker would simply state, “You are not alone” with all the o’s made out of Stars of David. If you love this idea, we would love to try to arrange for this to become a reality. The Left believes itself immune from the infection of anti-Semitism claiming the alt-right, all those not believing as the chosen of the Progressive movement, are the only anti-Semites in existence. Their targets are the White Supremacists, the Ku Klux Klan, the Nazis and others who simply hate everyone not like-minded which they believe includes all Jews. 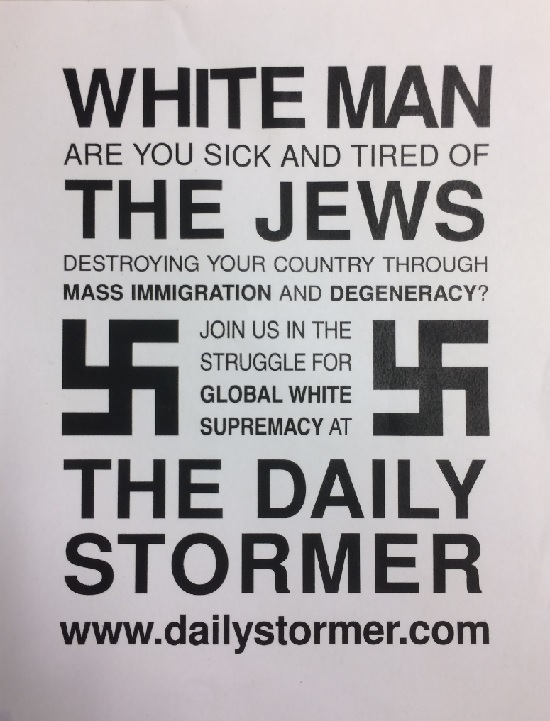 They find evidence such as the poster pictured below which calls for white people to join with these Nazis at the Daily Stormer which is a hate site. This, they claim, is the real threat the Jews face, not the leftists and their new friends in the Islamic world. They claim anyone purporting that Muslims are enemies of the Jews and Israel merely do not understand the problems in Israel and that, after all, “Islam is the religion of peace,” as they say over and over. 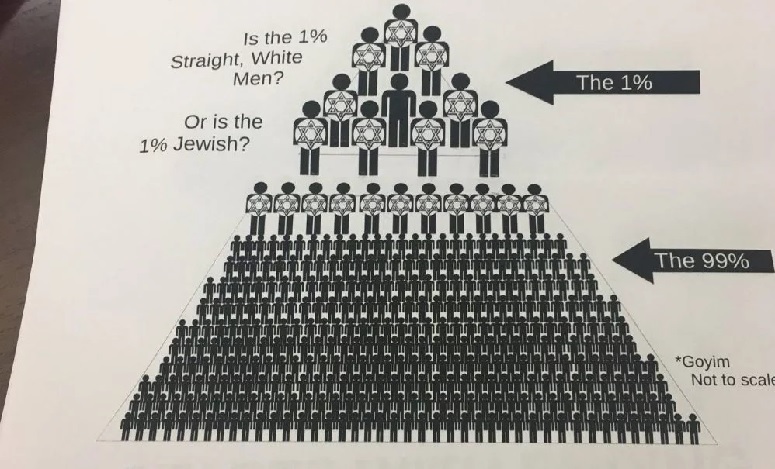 They point to the numbers of Jews who fill their ranks as the vast majority of American Jews, the Reform and Conservative movements as well as the New or Open Orthodox, a group of activist leftist Jews who desire to force Israel to accept their interpretations of a new Judaism which they wish to define with a definition which is more leftist than Jewish. But they accept these Jews so they cannot be anti-Semitic. Whatever you do, do not ask them about the very religious Traditional Orthodox Jews as the leftists have a great animosity for traditional Jews as well as Christians. To these leftists, all religion is simply superstition and the only truth in the world is their leftist agendas. They will tell you that all anti-Semitism exists solely on the right and the media will often agree with this definition. They will claim that their problem is not with the Jewish People; their problem is with the policies of Israel and especially with those of Prime Minister Netanyahu. This was so well exemplified by the efforts made by President Bill Clinton and again later by President Obama to defeat Prime Minister Netanyahu when he was running for election once each. President Clinton succeeded in getting Netanyahu defeated and all of a sudden, with a leftist government in power in Israel, the Democrats and the American left were all enamored with Israel. As soon as the Likud Party was reelected to power, then the love affair was over. Simply put, the American Left is only happy when the Israeli left is in power and when Israeli right and religious parties take power the American left goes ballistic, just as they have since President Trump was elected only not quite as insane. It is easy to understand, they believe that the only people who are groomed and destined to run the world are they and their fellow travelers. The left are the sole people who have the means of making the world into a wonderful place and when anybody else wins the election it is a scourge to be fought against with everything that the left can bring including revolution. There are groups such as Anti-Fa (anti-Fascist), Black Lives Matter (BLM), The Revolution, ANSWER (Act Now to Stop War and End Racism), Boycott, Divestment and Sanction (BDS), Students for Justice in Palestine (SJP), CODEPINK, End the Occupation Now, and numerous smaller groups plus the leftist media backing which also provides these groups political cover by under reporting their divisive actions and rhetoric and through portrayals which show them in an air-brushed image. The media is complicit in their reporting which gives full support to the left progressive and its agenda while giving critical coverage to those not on the left doing everything even to include inventing stories. This has been one of the items which were exposed by President Trump and which has severely damaged the remaining credibility of much of the media. In many ways, they have only themselves to blame. Their refusal to recognize the real anti-Semitism residing in their own camp is, at times, astonishing. When this anti-Semitic flier was found on the campus at the University of Illinois at Chicago, initially it was denied until numbers of them were produced and research was done by the Forward and Alan Dershowitz providing proof of the poster and its existence (see below). This is normal and is not restricted to posters but also to the lack of covering the near revolts and violence exhibited when conservative speakers are invited to speak at many Universities and the leftists actions either get the event cancelled, moved to a place well off the campus thus making it near impossible for students to attend, to shouting down speakers refusing to permit them to be heard. There have also been reports linking Anti-Fa and anti-Semitism, as was also found with Occupy Wall Street, and the left’s preoccupation with anti-Zionist and anti-Israeli activities such as the Campus events including BDS, Israel Apartheid Week, Palestinian Die-Ins and other demonstrations against Israel. Many of these demonstrations expanded from being anti-Israel to anti-Jew and all too often resulted in violence against Jews on these campuses. The problem is that Israel is simply the new Jew to be chosen for violation and destruction and anti-Zionism as the key to these efforts. The new anti-Semite will claim they are just against Israeli policies or they are not against Jews, just Zionists. Anti-Zionism is anti-Semitism unless one is against every mono-cultural or mono-ethnic nation which would include but not limited to being against Japan, China, both Koreas, India, twenty-one Arab nations, France, Germany, England, Scotland, Ireland, Russia and more. But the anti-Zionists are not against any of these monolithic nations, just the Jewish one, which is the definition of anti-Semitism. One will need to wait and see how these groups react to Kurdish calls for having their own independent nations and the Basque People or the Catalonian Movements in Spain, the Assyrians or the Zoroastrian movement in Iran or the Tibetan people who wish for a free Tibet which was conquered by China during 1951. 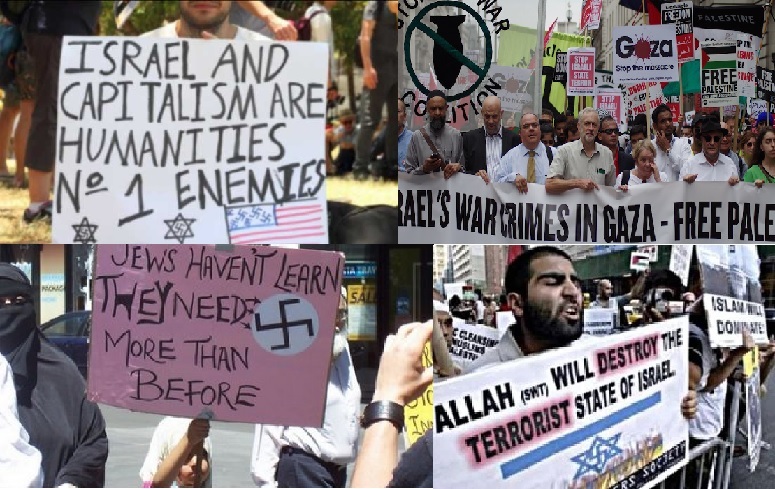 For reasons which the progressive left would like us to believe has nothing to do with anti-Semitism, the only group which is reviled and protested has been those supporting Israel and Zionism. There will likely be produced groups which will start to disparage the Kurds as Arab oil money and Islamic supremacy start to denigrate the Kurds should they start to move towards independence. 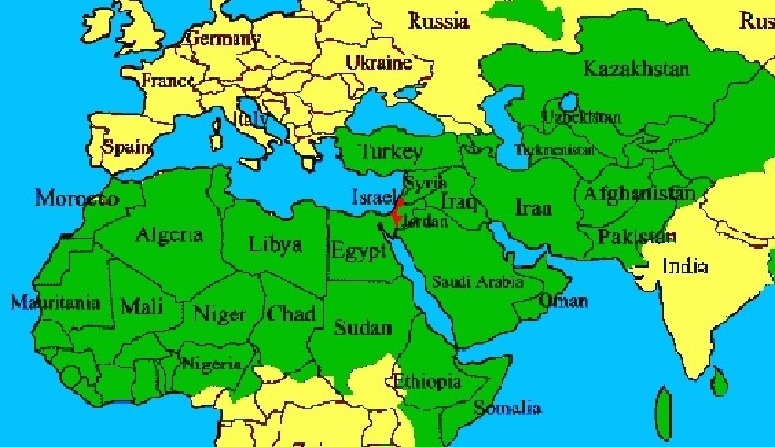 The Arab oil wealth combined with their stranglehold on Europe and affiliations with the Progressive left and the far left through their anti-Israel campaigns will utilize their connections to smear any effort by the Kurds for independence since the Kurds, despite being Islamic, are not the right form of Islam. The Shia will hate them because they are not Shiite Muslims and the Sunni Muslims will deny their independence on the basis despite their being Sunni as well simply because they are not Arab. There is a lesson to be learned in the fight with the Kurds by the other Sunnis and the hate for Iran by many Sunni as part of the great Shia-Sunni divide in Islam, the result is that the purest form of Islam which is to be desired is for there to be all Arab Sunni Muslims and once that purity is met, then comes deciding which Imam is the divine choice of the Prophet, and after that, who knows what the fight will be about or will this result that in the end there can be only one. The problem is all these protests claim that there must be a winner, a single surviving winner, to which we have an answer to those who claim that in the end there can be only one.